Fig. 4. 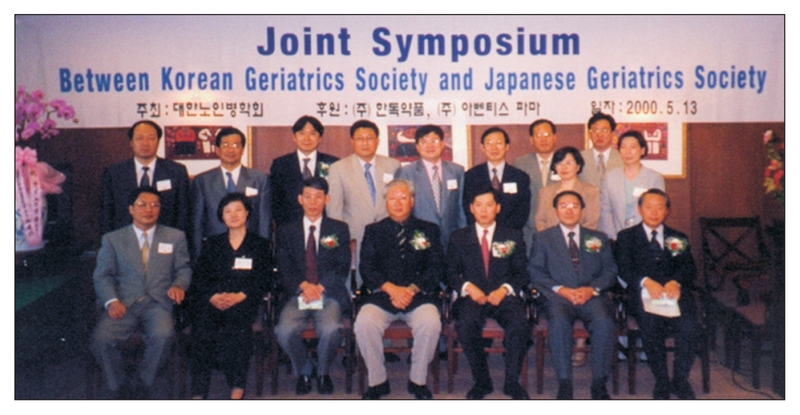 The 1st “Joint Symposium between Korean Geriatrics Society and Japanese Geriatrics Society” hosted by the Society, held on May 13, 2000 in Seoul National University Clinical Research Institute Garden View (clockwise from the bottom-right: Nagoya School of Medicine, Tokyo School of Medicine, Young Soo Lee, Kyoto School of Medicine, Nagoya School of Medicine, In Soon Kwon, Hyung Joon Yoo, Hong Soon Lee, Cheol Ho Kim, (skipping one person) Hong Woo Nam, Yong Deuk Jeon, Kyung Wan Min, (skipping 1 person) Hyun Wook Baik, (skipping 1 person) Eun Joo Lee.